Whether you run a travel agency company or just someone who loves to travel and wants to have a detailed plan documented, a Vacation Itinerary Template is always necessary. Having a ready-made itinerary PDF template will help you in planning for your travels and will maximize your time and expenditures. 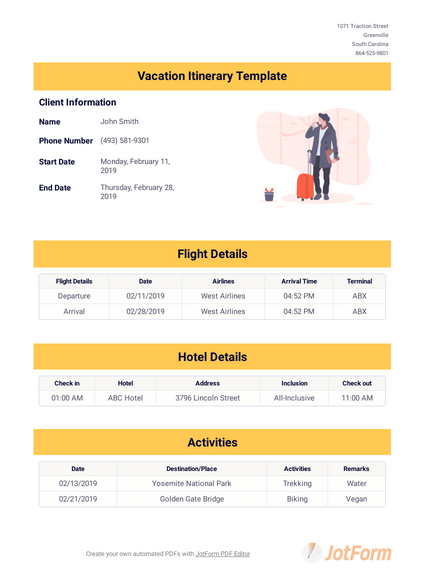 Try this sample Vacation Itinerary Template from JotForm. This template is designed to suit any kind of vacations but feels free to modify it. It has basic information such as the destination, date and time of arrival, places to visit, estimated cost and many more. You can change this information or add more if you want.